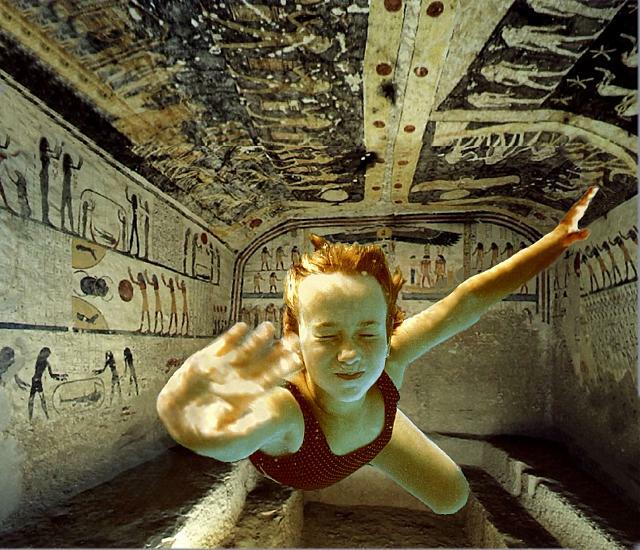 Photo "Swimming in the tomb"
It's my older work - one photo of my daughter under water combined with some three photos of egyptian tomb (in the Valley of Kings). Although it is my older work (some 2-3 years old) it is still my favourite one. Great combination of photos and good face expression. It has deeper meaning. Very creative. Excellent shadowing and color matching, good combination of photos. Wonderfully done. Great expression, very nice light and tones, well composed and original work! Great idea and photo! Very creative. Ty si vyhrajes V udoli kralu jsem byla,ale jaksi jsem si nezaplavala.Zapomela jsem si plavky Toto stvorit by me nenapadlo.Ma to vtip,technicke provedeni i kompizici na jednicku.